Breaking up isn’t easy. There are far too many emotions attached. Especially when hearts are broken. Sure, there are a plethora of reasons for a romantic detachment and it can take time to heal, but you’re bound to go through grief. 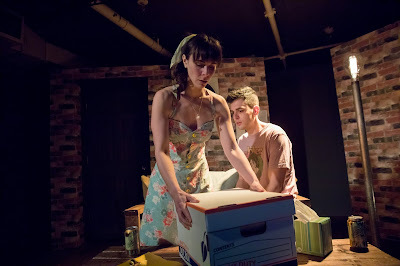 Presented by Ruddy Productions, Orion, written by Matthew McLachlan is a millennial rom-dram about a moving on from love and finding your worth when closure isn’t necessarily an option. Gwen has dumped Sam. For space. Or time to find herself. Or because of work. Or it’s all the clichés rolled up into one. Sam isn’t quite taking the break up with ease. He’s hurting, and rightly so. But as Sam tries to move on, he realizes that Gwen still has a hold of his mind and his heart. Sam’s best friend Scott tries to alleviate the pain through his goofy demeanor all while his romance with Abby is thriving. Orion is a story about life after love. Matthew McLachlan has a colloquial way about his words. His dialogue is snappy and deliberate. The characters he has crafted are clear. With the commercial nature of the story and the static staging by Joshua Warr, Orion screams movie. And that’s not a bad thing at all. The play easily transcends its medium. Where the piece did struggle a bit was the structure. Even though we learned some new information in the monologues, they weren’t essential and the content could have been incorporated in a slightly more active way, especially since the clarity of who was on the receiving end of the monologue was not entirely there. They did, however, pay off with the final beat of the play where the words intercepted to tie the piece off nicely with a bow. But the moment that hurt the overall arc of the story as well as some individual narratives was the flashback placement. The scene itself is a glowing highlight of McLachlan’s writing. It’s a beautiful and endearing scene. But by capping off the show with the key information we learn in the scene combined with everything leading up to it, it manages to weaken Sam and turn Gwen into literally the worst person ever, a title she may have already had. We learn in this scene that it was in fact Gwen leading the flirting that got Sam and Gwen together. Combine that with her breaking his heart and immediately finding a new love, she comes off as a selfish character. If this scene is integral, leading the show off with it and then jumping ahead in time to the true scene one allows sympathy to be had for Sam as he battles grief and a broken heart. The scene certainly colors the characters, the writing is brilliant, but Orion still flows without it. The other thing earned by introducing it at the start is the origin of Orion and what it means to the pair. Matthew McLachlan’s characters jump off the page. We know these people or, perhaps, have been these people. Maybe we’re currently these people. Nevertheless, the characters are relatable. It’s a testament to his writing. Director Joshua Warr took the baton and brought the best, and worst, out of the characters, guiding the company to find the heart, humor, and anguish within each. They are archetypes but they each had their own personal charm. With meticulous clarity given to the relationships, there was never a question of who these individuals were or who they were to one another. Scenic designer Alaina Hernandez created a multifunctional set that allowed Warr to create the distinct locations, including the integral park. But with the transitions playing a big part in the pacing, less would have been more as Warr’s staging was clear without the all accouterments. It did slightly affect movement within the space, recalling just why this piece had that cinematic charm. Despite being a four character play, Orion was essentially Sam’s journey. As the sad sap Sam, Blake Merriman broke your heart. Merriman reminded you that you’ve likely walked in Sam’s shoes at least once in your life. Merriman could have benefitted by giving Sam a bit more fight as he tries to find a way to walk through the world again without a significant other. Simply due to actions, Gwen is an utterly dislikable character. Gwen wants to have her cake and eat it too, often taking her feelings out on a person she claims to love. As Gwen, Amanda Jones played the text and played it well. By doing so, it was difficult to know the sincerity of the character. Taking on Sam’s best friend Scott, Scott Brieden was pure hilarity. Scott is a loveable goofball with a big heart and Brieden highlighted this trait well. As his girlfriend Abby, Simone Serra matched the charm of Brieden making them the bright light within the darkness of the story. Orion shines bright and has the potential to glow even brighter. Matthew McLachlan has a strong voice and way with characters, capturing the beautiful complexities of human relationships. If you’ve ever had your heart broken and need a reminder that you’re not alone, Orion is the closure you may need.